After the wort is boiled and cooled with the chiller, it must be aerated in order to re-introduce dissolved oxygen to help the yeast thrive and ferment properly. A lack of dissolved oxygen can result in an incomplete or stalled fermentation. There are many methods available to aerate wort. 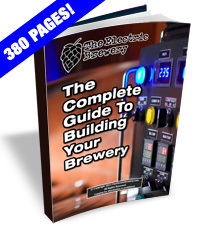 The simplest, practiced by many home brewers, simply involves vigorously shaking or stirring the wort. We employ a similar method using an Fizz-X agitating rod (similar to a paint stirrer) on the end of a hand drill as it takes less time (approximately 60-90 seconds). These agitating rods are sold under various names such as 'Degas-X', 'Fizz-X', and 'Brewgas Whizz Stick' and were originally sold for de-gassing wine. Made out of stainless steel and nylon, they are durable and easy to clean and sanitize. 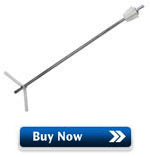 16" long stainless steel Fizz-X wort agitating rod used for aeration. 60-90 seconds is all that is needed. Simply attach the agitating rod to your hand drill, insert into the carboy/pail/fermenter and spin fast for 60-90 seconds. The trick is create a large funnel and churn air into the wort by making sure the nylon rods on the end are partially exposed to air. After there will be many inches of thick/dense foam on top of the wort. 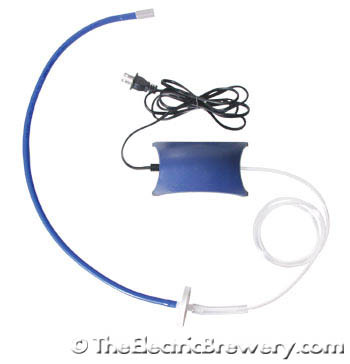 The blades on the agitator fold up to make them easy to insert into any sized carboy. We've also used an atmosphere based aeration system with pump and diffusion stone but find them extremely slow (they require 30-120 minutes to aerate) and are more work to clean and maintain. Care must also be taken when handling the diffusion stone as simple hand greases can clog the tiny pores. The filters also require periodic replacement. 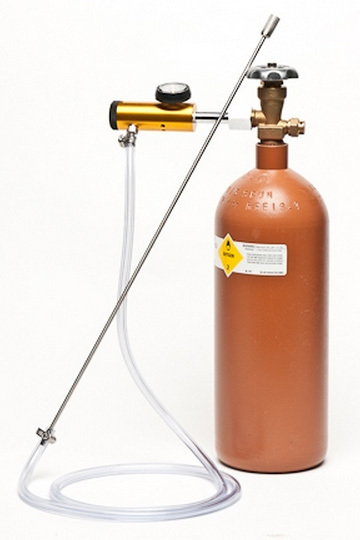 The aeration time required when using diffusion stones can be greatly decreased by using pure oxygen from a tank (since atmosphere is only 20% oxygen). This of course introduces extra equipment in the form of tanks and regulators, extra complexity, and still requires careful handling and cleaning. Aeration with pure oxygen, if not done properly, can also over-oxygenate the wort which can lead to other problems. We've never experienced stuck fermentations or poor attenuation with our agitating rod in beers ranging from 3% simple bitters to 12% barleywines, so we continue to use it even though we own more complex equipment. If you have difficulties reaching your target gravities, consider using an atmosphere based aeration system or a pure oxygen based aeration system. The latter is very useful in extremely high gravity beers and/or when high attentuation is required.